Neglecting either of these components will prove problematic at annual review time. As a leader, a major responsibility of your role is to manage and measure work, both yours and those of your direct reports. Therefore, it is incumbent on you to get well acquainted with your company's performance management processes and procedures. Once you are familiar with what is required, it is time to excute what is outlined. Unfortunately, too many leaders fail to master the skills associated with managing and measuring the work of others. Successful leaders, leaders who lead, understand how important it is to a team's overall performance. Clear goals and objectives identify what is expected and must include measures that tell if or when the goal is reached. Individual (and team) goals and objectives must be aligned with the organization's strategic goals and objectives. To do this, the organization must identify its goals and communicate them in such a fashion that they are understood to everyone within the organization. If this is not common practice within your organization, there may be a lot of activity but it will not be productivity. There is a BIG difference. Productivity is productive activity; it contributes to the mission and helps to move an organization closer to achieving its mission. Ideally, goals should be set by the first day of the fiscal year. (For most organizations, the fiscal year coincides with the calendar year which begins January 1.) Doing so gives the individual the full year to accomplish the goals and objectives. Once goals and objectives have been established for each individual, you must identify how you will measure what is achieved. 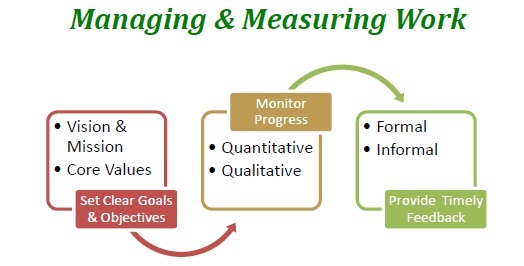 They should include both quantitative and qualitative data which will be used to determine what progress has been made toward reaching the goal. This allows you and your direct report to discuss progress against pre-set goals aligned with the organizations strategic goals and objectives. Providing feedback is very important to managing and measuring work and should be given in both formal and informal settings. For example, I recommend giving impromptu feedback close to the time the person's performance is observed. If it is positive feedback, I will not hesitate to make my comments in the presence of others. If it is constructive feedback, I recommend sharing that one/one. It is in line with one of Dale Carnegie's principles: "Praise in public. Reprimand in private." Formally, leaders should meet one/one with each direct report at least quarterly. The purpose of the meeting is to discuss performance: what is going well and what needs to be corrected. During the one/one is also a good time for you, the leader, to ask for feedback on how you can best help/support your direct report in reaching his or her goals.